We recommend checking out our discussion threads on the American Audio Sense 12 2-Way 12" Passive SENSE12, which address similar problems with connecting and setting up PA Speakers American Audio. The user manual for the American Audio Sense 12 2-Way 12" Passive SENSE12 provides necessary instructions for the proper use of the product Pro Audio - Live Sound - PA Speakers. 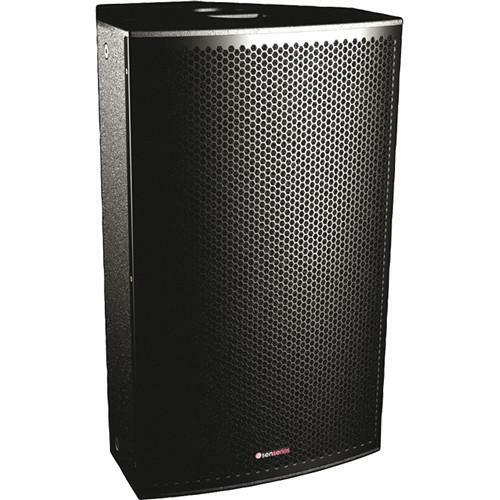 The Sense 12 2-Way 12" Passive Loudspeaker from American Audio is a professional-quality loudspeaker that's ideal for portable or installed applications in medium-sized venues. The rigid plywood cabinet has a durable black paint finish and a powder-coated steel grille with acoustic foam for lasting durability and performance quality. The speaker's asymmetric design and 45° angle structure let you position the speaker vertically or horizontally for FoH or stage monitor usage. The rotatable quadratic horn ensures optimal acoustic performance, regardless of cabinet orientation. The speaker has a 12" aluminum basket woofer with a 75mm voice coil, as well as a 1" compression tweeter with a 44mm voice coil. These drivers work together with the speaker's passive crossover system to deliver a wide frequency response with excellent dynamics. The tweeter is mounted on the horn to deliver a constant 75 x 50° directivity pattern to provide broad dispersion. The speaker has an LSM speaker management system and can accept up to 1400W of peak amplifier power for a strong, distortion-free performance. The rear panel has a pair of NL4 Speakon inputs for wide compatibility with a variety of sound systems or devices. The cabinet has a handle integrated into the top for convenient transportation. There are also M8 screws in each corner for attaching rigging eyes, ideal for suspended applications. A standard pole socket on the bottom panel allows you to mount the speaker on a stand or on top of a subwoofer. Box Dimensions (LxWxH) 28.0 x 17.5 x 15.25"
The user manual for the American Audio Sense 12 2-Way 12" Passive SENSE12 can be downloaded in .pdf format if it did not come with your new pa speakers, although the seller is required to supply one. It is also quite common that customers throw out the user manual with the box, or put the CD away somewhere and then can’t find it. That’s why we and other American Audio users keep a unique electronic library for American Audio pa speakerss, where you can use our link to download the user manual for the American Audio Sense 12 2-Way 12" Passive SENSE12. The user manual lists all of the functions of the American Audio Sense 12 2-Way 12" Passive SENSE12, all the basic and advanced features and tells you how to use the pa speakers. The manual also provides troubleshooting for common problems. Even greater detail is provided by the service manual, which is not typically shipped with the product, but which can often be downloaded from American Audio service. If you want to help expand our database, you can upload a link to this website to download a user manual or service manual, ideally in .pdf format. These pages are created by you – users of the American Audio Sense 12 2-Way 12" Passive SENSE12. User manuals are also available on the American Audio website under Pro Audio - Live Sound - PA Speakers.